Necklaces have always been in high demand for men, it’s a style that anyone can appreciate and wear. 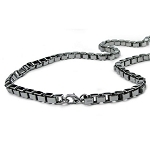 We have the largest selection of men’s stainless steel necklaces that are available in a variety of colors and styles. 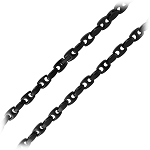 Our trendy features include a twisted rope chain that makes it easy to put on and take off. 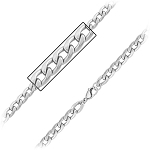 Whether you want to wear it by itself or attach a pendant to it, is completely up to you. Our stainless steel is made to look stylish but also be strong and durable. Made with polished stainless steel with modern, creative styles, our options are second to none. Whether you’re looking to wear it every day, or for special occasions, we’ve got choices that are suitable for your wants and needs. Ideal for casual and formal situations, our high-quality choices will make you look handsome and stand out every time you put it on. Whether you want to tuck it under your shirt or wear it over your shirt, the styling of it is completely up to you. We have several different sizes and dimensions to find the perfect length and fit for you. 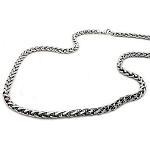 With our selection of men's stainless steel necklaces, you can put any pendants you have in mind on it. Show off the ideas and things you have passion for; anything will look great on our necklaces. Create your own unique style by picking something that really represents your personality. We invite you to be bold and daring when it comes to picking something in our selection. All of our choices are affordable and in style. Finding something you love has never been easier till now. 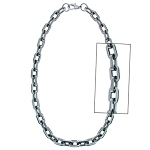 Men's stainless steel necklaces have been extremely popular recently. These materials will look and perform great over the years. They have been carefully crafted to last a lifetime. If you’re having a tough time figuring out what is really for you, give us a call. We can help you make a great decision. Our team is committed to providing excellent customer service!